Harnessing the transformative power of innovation will be critical if the world is to meet the goals of the UN 2030 Agenda for Sustainable Development. 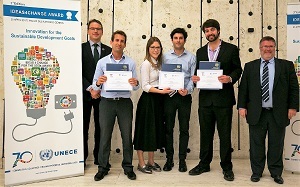 The UNECE Ideas4Change startup competition recognizes entrepreneurs who are developing innovative solutions with the potential to create productive jobs in an ecologically sustainable and socially inclusive way. Catalytic Innovations (United States), Inspecto (Israel) and DeBatelier (Italy). The Awards were announced at the Regional Forum for Sustainable Development on 25 April at the Palais des Nations in Geneva. There were five finalists selected from over 100 entries from 22 countries who pitched their ideas in front of an international jury and presented them to the participants of the Regional Forum. "Catalytic Innovations' technology converting airborne carbon dioxide into ethanol for use in consumer products, and as a renewable fuel source, is a great example of the kind of innovations we need to achieve sustainable development" said UNECE Executive Secretary Christian Friis Bach, who presented one of two awards on behalf of the international jury. The other international jury award goes to Inspecto, who has developed a handheld scanner capable of detecting pollutants in fresh foods, a groundbreaking, quick, easy to operate and cost effective method for the food industry to offer cleaner and healthier products to consumers. This award was presented by Jordan Aibel of MassChallenge Israel, in whose accelerator programme Inspecto had participated in 2016. DeBatelier, the winner of the popular vote by the participants in the Regional Forum, has created an organic material that can be used as a renewable substitute for leather and other fabrics in the garment and packaging industries. "Innovation is central to achieving the goals of the 2030 Agenda" said Philippe Ramet, who presented this award on behalf of Laurence Monnoyier-Smith, the Chair of the Regional Forum on Sustainable Development. "The Ideas4Change Awards are a great way of showcasing the contribution which startup companies can make." The finalists will get the opportunity to participate in the 2017 MassChallenge Israel global accelerator where they will be among 48 highly vetted teams gaining access to a world class program, mentors, investors, multinational corporations and other stakeholders. The Ideas4Change Awards were supported by the Governments of Israel and the Russian Federation.